Hebe ‘Red Edge’ forms a tight dome of grey-green, evergreen foliage 24 in (60 cm) or more high. The leaves are grey-green, with red margins, 0.8 in (2 cm) long; in winter they take on a reddish tint. Pale lilac flowers in early summer. A hebe hardy in the UK. This well-known hebe cultivar was raised by Graham Hutchins at County Park Nursery, and is probably a cross between Hebe albicans and Hebe pimeleoides. It is frequently used in landscaping schemes in the UK, and always looks good. 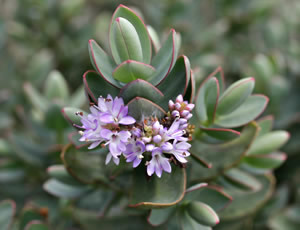 There are several variegated forms available, see Hebe ‘Silver Dollar’.